Two Kings, the latest book from Rabbi Fishel Jacobs, illustrates a parable rooted in the writings of King Solomon and developed by Chabad-Lubavitch Chasidic thought. Best known as an expert on Judaism’s complex ritual purity laws, a U.S. karate champion and Israel’s first – and for many years, only – American-born prison chaplain, Rabbi Fishel Jacobs doesn’t exactly strike the image of a children’s book author. But for the man who has written everything from in-depth treatments of Jewish law to a chronicle of transformation among Israeli prisoners, his latest book – an illustrated tale of a child’s conflicting impulses – is an accomplishment 30 years in the making. Launched last month, Two Kings actually draws on material dating back approximately 3,000 years. Inspired by a parable penned by King Solomon in Ecclesiastes and expounded on by Chabad-Lubavitch Chasidic thought, the book series illustrates a moral battle between one’s “good king,” or good inclination, and his “bad king,” or evil inclination. But while the subject matter is ancient, the idea of exploring the conflict through the medium of a children’s book came to Jacobs in the summer of 1979. Having just graduated from the University of Vermont, where he earned a Bachelor of Arts degree in comparative religion and Jewish history, Jacobs decided to fully immerse himself in the study of Judaism at a yeshiva in the central Israeli village of Kfar Chabad. The director of a Chabad-Lubavitch summer camp in Safed, however, had other ideas for Jacobs when he learned of the karate champion learning in a yeshiva just two-and-a-half hours away. But Jacobs needed some convincing before he would agree to become the camp’s sports director: While he wanted no part in what he considered a diversion from his studies, Jacobs finally agreed when the camp director mentioned that the camp served underprivileged kids. But the future rabbi wasn’t satisfied with merely using his talents to draw kids to the program itself. He wanted his demonstrations to also carry a positive message, so he developed a skit based on the parable of the two kings, in which a child volunteer is called up to the stage and acts out a conflict between babysitting a sibling or going to play with their friends. Jacobs has used the skit in demonstrations for the past three decades, but while he continually mulled the idea of putting it in print, he set his mind on other challenges. First came a decade of intensive Torah study. Rabbinic ordination through Chabad-Lubavitch in 1983, and was followed by an advanced level of ordination through leading rabbis in Israel. In 1986, he embarked on a more-demanding course in teaching Talmudic theory, eventually earning the equivalent of a Ph.D. in the subject through the Israeli Ministry of Education in 1995. In the midst of his advanced studies, Jacobs and his wife Miriam helped found the first Chabad House at Tel Aviv University. While living in Kfar Chabad, the couple would visit the campus regularly to lead classes and discussions. On Shabbat and holidays, they would move with their children to the university in order to provide kosher meals, services and other programming. But Jacobs added more to his plate when he started working part time as a chaplain at Israel’s notorious Ayalon Prison. He was quickly promoted by the Israel Prisons Service to full-time chaplaincy, and was given command of a men’s prison, a prison hospital and Neve Tirzah, Israel’s women’s prison. Determined to help the women in his charge emerge from prison with a chance towards rehabilitation, Jacobs took on what he saw as one of the main obstacles between some of the prisoners and a healthy future: abusive marriages to career criminals who were refusing to grant a divorce. With the encouragement of the Prisons Service, the rabbi and father of seven undertook a rigorous two-year course of study to become certified as a rabbinic attorney by Israel’s family courts. After 13 years of service, Jacobs retired from the prison system in late 2005 with the rank of major. 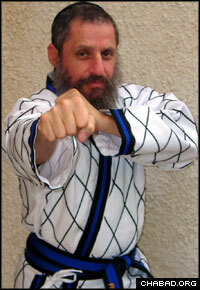 Rabbi Fishel Jacobs is a noted expert in martial arts. From his home office in Kfar Chabad, Jacobs relates some of the lessons about human nature he’d absorbed working with prisoners and why those lessons became the impetus for finally turning the educational skit he’d developed for his karate demonstrations into a series of books. With the Prisons Service, and a book about his experiences, Israel Behind Bars, behind him, Jacobs finally turned to the children’s book project. He worked with dozens of graphic artists before choosing one whom he felt really understood the message of the parable. “There is a lot of philosophy in these books,” says Jacobs. “We wanted the bad king to be like he’s described in the Tanya,” the bedrock work of Chabad-Lubavitch thought penned by the first Chabad Rebbe, Rabbi Schneur Zalman of Liadi, in 1798. Too many artists wanted to draw a king that children would be afraid of, but the bad king in Jacobs’ book can be seen as a powerful potential ally, a force that a person can utilize to accomplish a great deal of good. Looking at his own life, Jacobs says that he’s fused together so many disparate facets.